Less than a year ago, Mary McFadden moved into an apartment at Heritage Communities. It already feels like home for the 80-year-old. 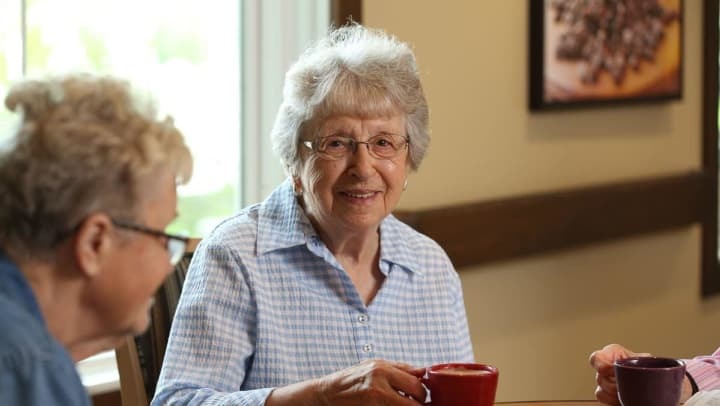 Wondering what senior living is like? We talked to Mary about her experience at Heritage Communities. Q: How did you choose Heritage Communities? A: I checked out two other places. All of them were very nice. The Heritage location, however, was in my old neighborhood. Although I was no longer living in that area, the home where we brought up our family is there, and so is my home parish Catholic church. I had a couple of friends who were here that really liked it. It just seemed homey and very friendly, and I’ve found it to be a very happy place. Q: How did you decide when to move to senior living? Q: Has the move been good for your health? A: I’m getting better exercise here. I have the opportunity to walk the halls, and they have exercise classes, too. Q: What are your favorite activities? A: I participate in almost everything. There are exercise classes and creative art classes. We go to the movies and have pub time once or twice a week. There’s a bus that will take you shopping or to church. Sometimes we take surprise bus trips, to fun places like the zoo or to see new areas. They also have religious activities available to all religions. Everyone is invited. This Friday I’m going to a Jewish prayer service. Q: How would you describe your experience at Heritage Communities? A: We’re very congenial, a very kind community. We try to stress that amongst ourselves, and we talk about it. Everyone goes out of their way to speak to each other, sit with different people. We try to have a positive attitude and be happy and try to do things for other people. When you’re here, you pick up on it right away. All the people here try to make it that way, not only the residents, but also the workers. We’re all working toward making this a happy place for everybody. And that’s the ticket. Q: What’s your advice for someone considering a move to Heritage Communities? A: Come on in! There’s nothing to be afraid of. You’ll love it. It’s really a wonderful place. We joke and say we think we’ve died and gone to heaven. Everyone is so kind, so much is done for you. What more could you ask for? Read the first installment of our Senior Living Stories, and find a Heritage community near you.